Leslie Calvin "Les" Brown (born February 17, 1945) is an American motivational speaker, author, radio DJ, former television host. As a former politician, he was a member of the Ohio House of Representatives (1976-1981). As a motivational speaker, he uses the catch phrase "it's possible!" and teaches people to follow their dreams as he learned to do. He was the host of The Les Brown Show. Brown was born with his twin brother, Wesley, in an abandoned building in Liberty City, a low-income section of Miami, Florida. He was subsequently given up for adoption and adopted by Mamie Brown, a 38-year-old single woman who worked as a cafeteria attendant and domestic assistant. According to his motivational speeches, he was declared "educable mentally retarded" while in grade school. This damaged his self-esteem and confidence. Yet, he learned how to reach his full potential with the encouragement of his mother and assistance from a helpful teacher in high school. According to many of Brown's speeches, he first decided to get into public radio and kept returning to the same radio station time and time again looking for a break. It wasn't until the on-air failures of the afternoon DJ that he took his break in radio into his own hands and was hired full-time as on-air talent. Upon his termination from the radio station, he ran for election in the Ohio House of Representatives and won. After leaving the Ohio state legislature, he decided to get into television and eventually ended up on PBS. He also formed Les Brown Enterprises in order to support his newest career as a motivational speaker and was on KFWB in California on a daily syndicated radio program from 2011 to 2012. In the late 1980s and early 1990s, he also won many local and national awards for excellence and he has an Emmy to his name. Brown was a member of the Peabody Awards Board of Jurors from 1982 to 1988. 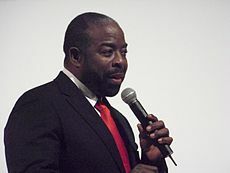 In 1993, he began hosting a new talk show, The Les Brown Show, which began airing on September 6, 1993. After nearly four months, it went on hiatus on December 3, 1993, and on January 17, 1994, King World Productions replaced this with Rolonda, a show hosted by Rolonda Watts. Les collaborated with John C. Maxwell and The John Maxwell Team for a candid look into the lives of professional speakers called "The Good, The Bad, and The Ugly". Brown married Gladys Knight in 1995; they divorced in 1997 and Les talks about this during the hosting of his shows. He has ten children: Calvin, Patrick, John Andrew, Ona, Ayanna, Tayloria, Thad, Sumaya, Serena and John-Leslie. He also has 15 grandchildren and two great grandchildren. Council of Peers Award of Excellence, National Speakers Association, 1989; regional Emmy Award (Chicago), 1991, for the program You Deserve with Les Brown; selected as one of America’s top five speakers, Toastmasters International, 1992. ^ "Leslie C. Brown | Ohio Statehouse". www.ohiostatehouse.org. Retrieved 2019-03-29. ^ "Meet Les Brown - Motivational Speaker, Speech Coach & Best Selling Author". Les Brown Enterprises. Retrieved 18 August 2014. ^ "George Washington Williams Room - Legislators". The Ohio Statehouse. Retrieved 18 August 2014. ^ Freeman, Mike (3 January 1994). "King World Productions replaces 'The Les Brown Show' with 'Rolonda Watts'". HighBeam Research. Archived from the original on 5 November 2012. ^ "The Good, The Bad, and The Ugly", Youtube. ^ Company, Johnson Publishing (1995-10-09). Jet. Johnson Publishing Company. ^ "Pain and Glory - Vol. 48 No. 23". PEOPLE.com. Retrieved 2017-11-17. This page was last edited on 11 April 2019, at 11:26 (UTC).